Dave Francisco, President of Frisco Enterprises, Inc. started out in business in March of 1985. His intention was to provide his customers with quality products, honest and dependable service, all at a fair price. Starting in 1985, Dave ran a custom home framing crew. From there he built custom homes, kitchen remodels, room additions, total home renovations, bathroom remodels, and insurance work. In 1989, he was granted the Gutter Helmet dealership from American Metal Products for 15 counties in central Indiana. With this new endeavor, his Father, Jim Francisco joined him to help with trade shows and marketing. From early on, Dave believed that treating his customers the same way he would expect to be treated would serve as a solid foundation in which to build and grow his business. Now over 28 years later, this philosophy holds true. 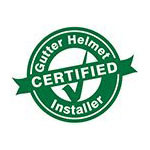 Today, in addition to Gutter Helmet, Frisco Enterprises offers excellent home improvement services including the installation of seamless gutters to keep your home fully protected from the damaging effects of improperly drained rainwater. The combination of seamless gutters and the Gutter Helmet gutter protection system gives you the most effective and reliable drainage for rainwater coming off your roof. Overflowing water can damage your foundation, cause basement leaks, and compromise your walls and the roof. Gutter Helmet prevents leaves, twigs, pine needles and other materials from entering your gutters and clogging them. The resulting clog causes rainwater to spill over the sides instead of going out the downspout and away from your home. The uniting of our advanced gutter cover and seamless gutters gives the water no place to go but down and out your rainspout. To learn more about our services please call (800) 824-3772 today or fill out our online form. We look forward to hearing from you!